Turnitin UK have recovered from the backlog of submissions. There no delays in generating new reports. Turnitin support team advises that the submission issues with the Turnitin UK have been resolved, however there may be some delay in report generation. Students will still recieve the email to their student email account confirming the submission. LTD team will keep you updated on any changes to the Turnitin status. 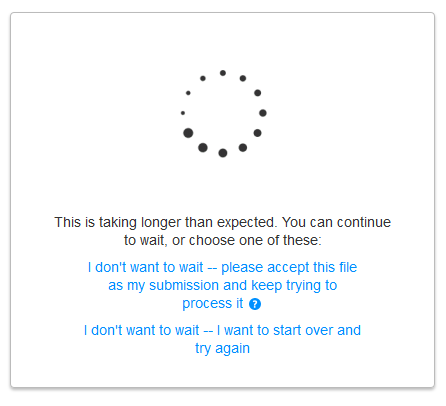 Turnitin technical support team confirmed that submissions issue has now been resolved, however, there is still a delay in report generating. Students will still receive an email confirmation to their student email address confirming their submission, but will not be able to access their reports yet. If you are a student and see the screen above, LTD suggests that you select the link ” … please accept this file as my submission …”. You will then receive a confirmation to your student email from Turnitin that you have “… successfully submitted the file …”. Blackboard Collaborate will be performing system maintenance on Sunday, April 13, 2014 from 03:00 (3 am) and 11:00 (11 am). Learning Edge Blackboard 9.1 will be unavailable for four hours between 01:00 (1am) and 05:00 (5am) on Friday 4th April 2014. The Blackboard Managed Hosting Infrastructure Team will be performing infrastructure maintenance. This maintenance is service impacting. The Blackboard Managed Hosting Infrastructure Team will be performing emergency infrastructure maintenance between 01:00 (1am) and 05:00 (5am) tonight Tuesday 1st April 2014. This maintenance is not expected to be service impacting.